In case you're wondering how an event generates "news" (such as coverage in the New York Post's Brooklyn blog and Prospect Heights Patch), consider this press release, issued by the New Jersey Nets and then by Borough President Marty Markowitz's office. Note that Brook Lopez got bumped up to "star" in the headline, and the entire cast, most of them unknowns, were deemed "stars" in Patch, which did manage to get some candor from Lopez about how a sports team's move is "always tough." Note the role of the Salvation Army, which has sent representatives to public hearings to support the Atlantic Yards project. Also note the hand of marketer Brett Yormark, who manages to shoehorn in another Nets sponsor to get some publicity. Paging Daniel Boorstin? BROOKLYN, NY -- NETS players Brook Lopez, Derrick Favors, Ben Uzoh, Quinton Ross, Stephen Graham, and Joe Smith today gathered at Brooklyn Borough Hall for a holiday party where they helped to distribute toys for children from five Salvation Army community centers in Brooklyn. The toys were donated by the Barclays/Nets Community Alliance, which includes a partnership among Barclays, the NETS, and Forest City Ratner Companies. Presented by National Grid, a NETS sponsor, the holiday bash provided toys to children who otherwise might not have received any during the holiday season. The event was also attended by Brooklyn Borough President Marty Markowitz, and representatives of The Salvation Army and National Grid. "Every year during the Holiday season we celebrate and are thankful for what we have," said Bruce Ratner, Chairman and CEO of Forest City Ratner Companies. "There is no better way to do this than by remembering and helping those who are less fortunate. I want to thank the NETS players who have taken the time to be here with the kids and to help them really celebrate this Holiday season." "We really appreciate being part of such a meaningful event in Brooklyn and celebrating the holidays with the kids," said Brook Lopez, the NETS star center. "We hope these toys bring a smile to their faces and we wish them the best this Holiday season." 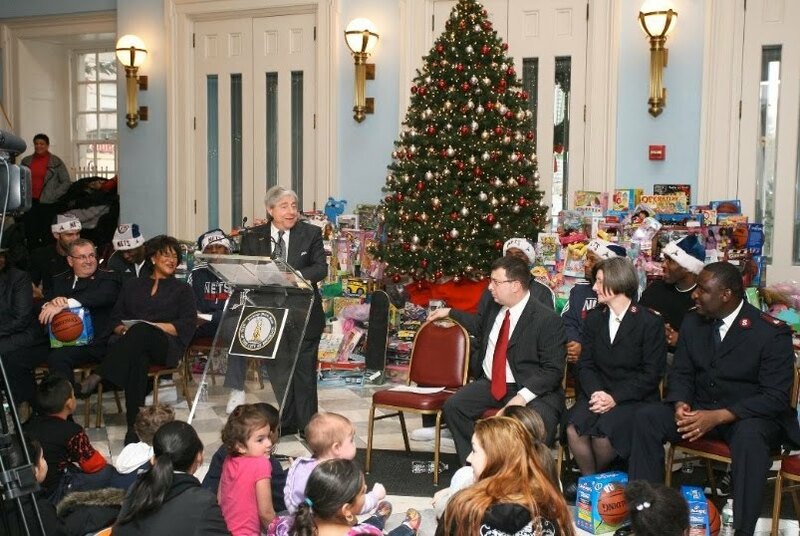 "Again this year, I am proud that our soon-to-be Brooklyn NETS are scoring a real 'three pointer' by providing more than 1,100 toys for children," said Brooklyn Borough President Marty Markowitz. "To the Barclays/Nets Community Alliance, Forest City Ratner, National Grid and The Salvation Army, I say 'bravo!' for teaming up with my office and making sure our young Brooklynites get caught up in all the holiday 'hoop'-la!" "There is no better gift than the light in a child's eyes when they receive a favorite toy," said Lt. Colonel Guy D. Klemanski, the Divisional Commander for The Salvation Army Greater New York Division. "Thanks to our partners here in Brooklyn that light should shine brightly." "National Grid is pleased to note its fourth year as a sponsor of the Barclays/Nets Holiday festivities," said Jim Madej, Senior Vice President of Customer Energy Solutions at National Grid. "National Grid has a strong commitment to Brooklyn and all the communities we serve. With a special focus on education and the environment, National Grid supports programs to help improve the way people live, work and have fun." In addition to the toys that were distributed at the event, the Barclays/Nets Community Alliance donated toys to Brooklyn youngsters at Salvation Army centers in Bedford-Stuyvesant, Bushwick, Brownsville, Bay Ridge, and Sunset Park. The toys were on display at Monday's event. This is the third consecutive year that toys are being donated under the Barclays/Nets Community Alliance, which works to improve the lives of young people in Brooklyn and surrounding communities through sports and other activities, including education and health care. It is the seventh year in a row that Forest City Ratner Companies and the NETS have teamed up with The Salvation Army. The NETS will be relocating to the Barclays Center in Brooklyn for the 2012-13 NBA season. 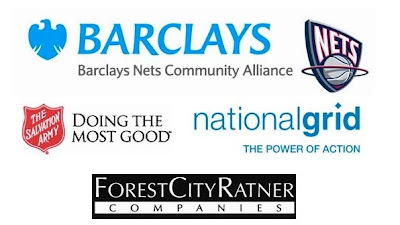 Created in November 2007, the Barclays/Nets Community Alliance invests $1 million per year in local non-profits. In October 2008 the Barclays/Nets Community Alliance announced that it was in part funding eight new playgrounds in Brooklyn, the first of which has opened at P.S. 19 in Williamsburg. In June 2009, the Barclays/Nets Community Alliance also helped to fund a new playground that is shared by Public School 175 and Promise Academy I Elementary School in Harlem.